As 54% of the 75 million Americans who suffer from hypertension know, leading a heart-healthy lifestyle is easier said than done. The Complete DASH Diet for Beginners offers the easiest way of startingâ€”and sticking withâ€”the DASH diet by walking you through every step, ensuring your evolution to better health is as stress-free as possible. 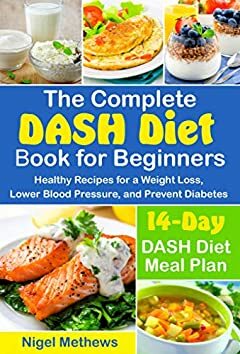 In The Complete DASH Diet Book for Beginners to lower your blood pressure, Nigel Methews, Â lays out an effective and easy to follow 14-day DASH diet meal plan to help you start and stick to healthy habits. Featuring over 50 low-sodium, high-potassium, and magnesium-filled recipes, Lower Your Blood Pressure is your kick-start guide to get your heart beating right. A 14-day DASH diet meal plans that include suggestions for shopping on a budget and making the most of leftovers. As the author of numerous successful meal plan cookbooks, such as The Complete Ketogenic Diet Cookbook for Beginners and Type 2 Diabetes Diet Cookbook & Meal Plan, Nigel Methews knows what it takes to help readers improve their heart health and manage other concerning conditions. Now, in The Complete DASH Diet for Beginners, she shows you exactly what you need to do to achieve the results you wantâ€”and serves up everything you need to get there on one simple, delicious, heart-healthy platter. The Complete DASH Diet Book for Beginners is A Complete Guide with Delicious Recipes and a 14 Day Meal Plan!